Happy Earth Day! Hope you will take some time today to think about the earth and life on it and how you can help to make it better. It's just about planting season in many parts of the US, so as you think about what to plant you can get plants that will help butterflies. Plants native to your area are best. Annuals like Zinnias that you can plant from seed fairly inexpensively are a great choice. You can see in my image for today that the butterflies do indeed enjoy it and because they are long lasting, are a source of food for them when everything else has finished blooming. 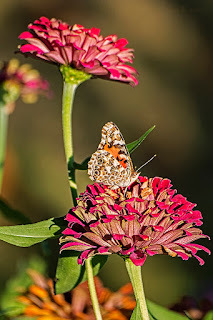 I captured this Painted Beauty on the Zinnia blooms late last autumn.